Imagine walking outside your home and your office is five minutes away. Imagine taking an hour break from work where you can pick up your child from school, go to the gym, and go grocery shopping. Imagine not having to take a long subway commute to work ever again. This is the reality for those who cowork at The Austin Space. Unlike a traditional office space, coworking spaces consist of individuals from different industries and are working on different projects. Coworking is the use of a working environment to share ideas, space, and knowledge. The Austin Space is one of the few coworking spaces in New York City that is part of the suburban coworking movement. Mostly freelancers, solo business owners, or remote workers are interested in coworking in a suburban neighborhood. Most members do not require the space for the entire month - usually, they need a nice, quiet space for a few days per month. In addition, they want the flexibility to choose when they want to cowork. Most have never coworked before. A majority of our members rather work from home than commute to a coworking space in Manhattan, if they are not required to commute. The Austin Space is usually the first time they have a dedicated workspace outside of their home. THE DEMAND - "Work from home professionals"
According to the Center for an Urban Future, Kew Gardens, Forest Hills, and Rego Park have one of the highest percentage of residents working from home in the borough of Queens. In Queens, Kew Gardens and Woodhaven (tied with Rockaways) come in first with the highest percentage of employed residents who work from home (4.5%). In Queens, Forest Hills and Rego Park follows closely in second place with 4.4% of employed residents who work from home. The average percentage of residents who work from home in New York City is 3.9%. According to DNAInfo, the estimated number of residents who work from home in Kew Gardens, Forest Hills, and Rego Park is 2,600. These numbers are staggering as we do not usually think of Forest Hills or Kew Gardens as the "work from home" neighborhoods in Queens. These two neighborhoods are family friendly known for the safe streets, great schools, and parks. We started The Austin Space to inspire community members to think differently, to innovate, and to interact with others. We wanted our space to be more than a space - we wanted to build a thriving ecosystem of like-minded passionate individuals. From the get go - Forest Hills, Queens isn't usually thought of the hotspot for budding products and ideas. 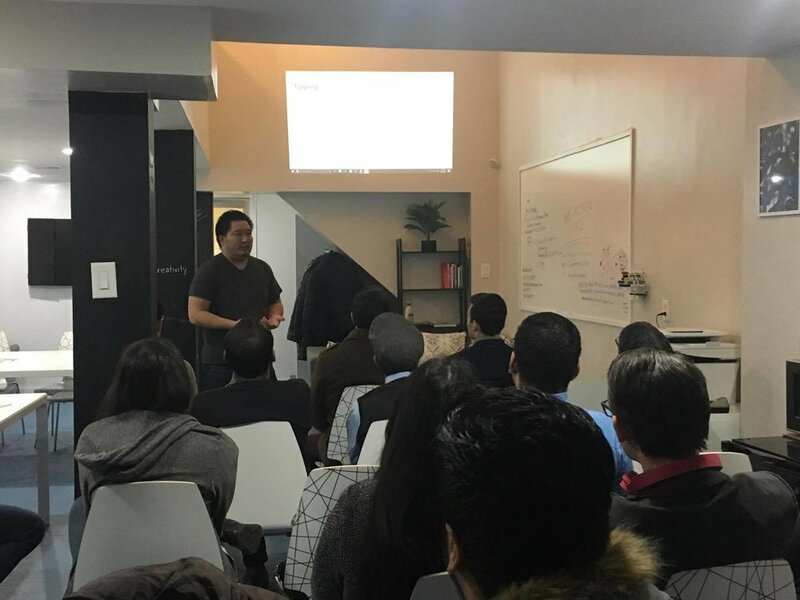 We take our meetups, community events, and even individual tours very seriously as these are the moments when we get to know the community and for the community meet each other. Since the inception of the space, we have built so many great connections with those in the local community. Last night, on February 16, 2017, we hosted our first startup pitch night at The Austin Space. It's exciting when some of our very own coworking members take the stage. They were able to showcase their products and companies. Milly Bot: Our member, Dave Luke, presented the Milly Bot - a messenger bot for users to get advice and recommendations on local food and drink spots. Dave demoed the bot, which works by the user asking a question relating to food and receiving a variety of responses. The responses include a Yelp suggestion and an option to ask a live expert. Experts are people who are local to that particular neighborhood and will be alerted instantly, allowing them to reply to the recommendation questions. The audience saw this as a great alternative to getting quick recommendations as opposed to searching endlessly on Yelp or Google. TrakBelt360: One of our huge supporter and fan from the start, Chris Landano, presented his patent pending utility belt, TrakBelt360. The TrakBelt360 is the first utility belt that lets you rotate tool pouches around your waist for safety, comfort and complete versatility. Chris brought in a prototype of one of the belts and walked everyone through the process of coming up with an idea to manufacturing the product. FunkyFloss: Joshua Belke, one of our coworking members, presented Funky Floss - a fun and new take on flossing. Funky Floss is a product that Josh has been working on for many years. He brought in a samples of the floss for everyone to try and the feedback was extremely positive. Josh's take on the product is to build an easy way to develop good habits while having fun. Crowquetica: Veronica Nizama, a member of our space, showcased her soon-to-be live action adventure game. She told the story of the game and inspiration behind it. Her presentation had graphics and animations from the game as well as explain how lucrative the game industry is. Veronica is currently working on a Kickstarter campaign to fund the design and development of the game. Crossover: Joseph Marasigan, one of our newer members, presented Crossover, a new take on recruiting for remote positions. Crossover not only connects companies to the best talent from around the world, but also provides a seamless end-to-end solution for remote team management. It was a huge success! Thank you all for coming.